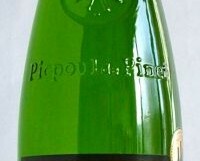 Light crisp and refreshing with clean green apple fruits. Perfect with a bowl of mussels. Part of the SuperValu Specially Sourced range, this is a decent well made dry white wine. Many Picpouls these days seem to be quite high in alcohol, with a sweetish finish. This wine tastes the way Picpoul should; the Muscadet of the south.